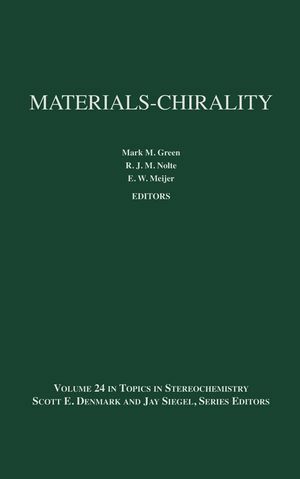 Topics in Stereochemistry, Materials-Chirality provides comprehensive information on the stereochemistry of materials. Coverage includes the chirality of materials and the important role stereochemistry plays in the physical properties of polymers, liquid crystals, and other materials. Mark M. Green is Professor in the Herman F. Mark Polymer Research Institute at Polytechnic University. R.J.M. Nolte is Professor in the Department of Organic Chemistry at the University of Nijmegen. E.W. Meijer is Professor in the Laboratory of Macromolecular and Organic Chemistry at Eindhoven University of Technology. Chirality of Catalysts for Stereospecific Polymerizations (Gaetano Guerra, et al.). Chain Conformation, Crystal Structures, and Structural Disorder in Stereoregular Polymers (Claudio De Rosa). Optically Active Polymers with Chiral Recognition Ability (Yoshio Okamoto, et al.). Chirality in the Polysilanes (Michiya Fujiki, et al.). Chiral Molecular Self-Assembly (Mark S. Spector, et al.). Chiral Discotic Molecules: Expression and Amplification of Chirality (L. Brunsveld, et al.). Some Correlations Between Molecular and Cholesteric Handedness (Giovanni Gottarelli and Gian Piero Spada). Ferroelectric Liquid Crystal Conglomerates (David M. Walba). Nonlinear Optics and Chirality (Thierry Verbiest and André Persoons). Cumulative Author Index, Volumes 1-24. Cumulative Title Index, Volumes 1-24.